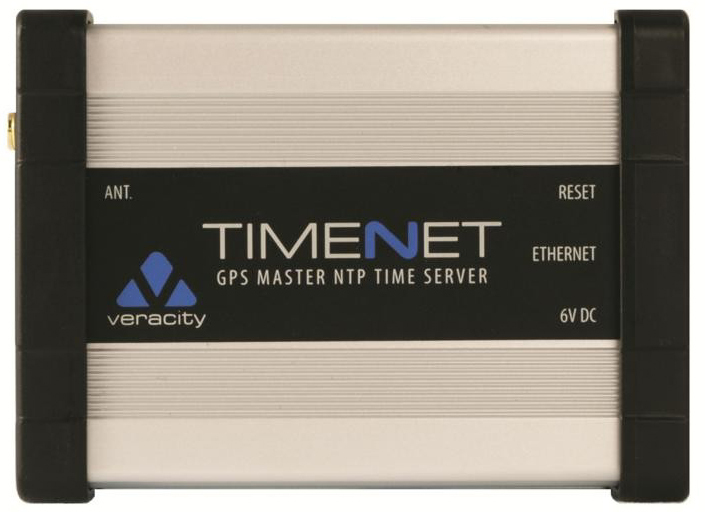 TIMENET, a GPS Master NTP Time Server, provides a low-cost solution to the problem of providing accurate reference time signals for CCTV recording equipment. Veracity CAMSWITCH Plus switches are 4 or 8-port IEEE 802.3af/at PoE switces especially designed for IP video applications. TIMENET provides a low-cost solution to the problem of providing accurate reference time signals for CCTV recording equipment. CCTV and digital video recorder (DVR) installations require accurate reference time signals for synchronisation of system clocks to ensure that they are always set at the precisely correct time. It is crucial that all recordings are accurately time-stamped, especially for evidential purposes. Many DVR products, especially those which are PC-based, have inaccurate internal clocks which drift by many seconds per week. Many DVR systems may be left unattended for months on end, and the time settings can end up being in error by many minutes. The traditional solution to providing an accurate reference time has been to use an atomic clock radio receiver or GPS sensor linked to an expensive rack-mounted master clock server, typically with serial-only output. Network output versions tend to be even more expensive. For this reason, master reference clocks are normally only used in very high-end installations such as city centres, airports and prisons. 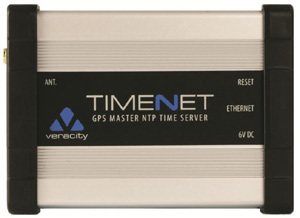 TIMENET integrates the GPS receiver and master NTP clock server into a single device which can be directly connected to the network. TIMENET is extremely compact, can be wall-mounted, uses very little power and is less than half the cost of competing solutions. The time server unit is very simple to install and set up. The GPS antenna is included with the TIMENET product. The antenna itself is provided with a self-adhesive surface which can be affixed to any window which has a view of some sky (to pick up the GPS satellite transmissions). The TIMENET unit can be positioned anywhere within the 3m reach of the antenna lead, and may be conveniently wall-mounted with the integral brackets supplied. TIMENET is then connected to the network through its RJ45 connector directly to the CCTV/DVR network using a standard CAT5 cable (up to 100m long). The TIMENET setup program is run on any Windows PC, and the only parameter to set is the desired IP address of the TIMENET device. This completes the time server installation. Any DVR or other NTP-compatible network devices can now be programmed to get their NTP time signals from the IP address of the TIMENET server. [Find out more...] Veracity TIMENET "Technical Data Sheet", 1,541 kB pdf file. [Find out more...] Veracity TIMENET "Quick Start Guide", 897 kB pdf file. OmegaCubed.net does not sell on-line. Orders (See Order Options for Details) can be placed by telephone, email or fax.